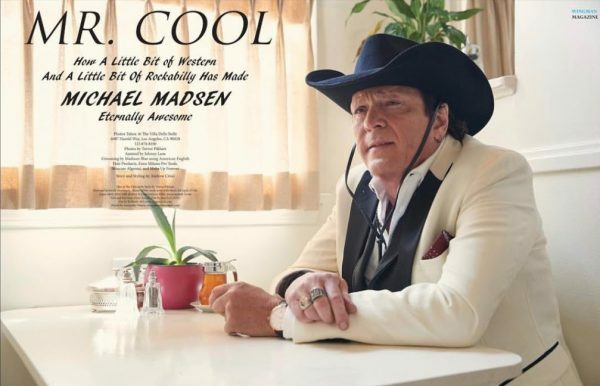 Wingman Magazine, a publication for Hollywood lovers, recently featured actor Michael Madsen (pictured above, styled in our white meshwool tuxedo blazer with a black silk lapel). For many, Madsen is best known for his roles in Quentin Tarantino movies including iconic scenes in Reservoir Dogs, Kill Bill Vol 1 & 2, and The Hateful Eight. For us, this Tarantino connection sparks another noteworthy collaboration in our own history with celebrated leading actress, Uma Thurman (pictured below wearing a Stephen F signature shirt). Often hailed as Quentin Tarantino’s muse, Thurman starred in Pulp Fiction and Kill Bill Vol 1 & 2 (just to name a few).